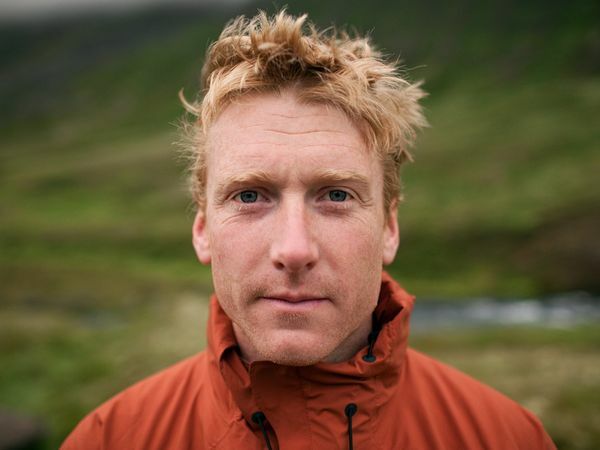 Alastair Humphreys is an adventurer, blogger, author of five books, motivational speaker, film maker and photographer. He is a National Geographic Adventurer of the Year. "To seek, to strive, to find, and not to yield: that’s what I want." World bicycle traveler and adventurer, in 2011 Alastair decided to remain in the UK in order to encourage people to seek out adventure and wilderness closer to home, challenging themselves through microadventures. His website includes a blog, posts (with videos) of his adventures, a microadventures tab, books, videos, advice, and encouragement. Bicycle Touring Pro: Darren Alff hosts a site of "how-to bicycle touring information." The site describes itself as "the world’s most popular bicycle touring website," including "a community of readers in just about every country across the globe." The site includes a "how-to" section, a blog, and resources, including Darren's commericial writing materials on touring. "BicycleTouringPro.com is a website for people around the world who are interested in bicycle touring and world travel. Whether you are searching for your perfect touring bike, planning to take a guided bicycle tour, an ultra-lite cycling adventure, or a long-distance bicycle tour of any kind, there is something here at Bicycle Touring Pro just for you! You will also find a repository of useful articles, interviews, and videos about traveling the world by bike." "Cycling the World as a Photographer," by Nicolas Marino, is an article contributed to The Luminous Landscape photography website combining two passions. Marino discusses philosophy, techniques, equipment, and the process of photographing the world via the bicycle. The bicycle's slow pace gives you the time you need to appreciate the roads you travel on a different and deeper level; with it, you fully immerse yourself in your journey. . . . When local people see you passing by on your bicycle, you trigger a myriad of feelings in them that range from curiosity and amusement to surprise and perplexity and even to pity and compassion. Whatever the case is, you get the empathy and the treatment that somebody passing by on a super Toyota Landcruiser or a BMW motorbike certainly wouldn't. CycloCamping: Stephane and Sheri Marchiori share their world bicycle touring experience, including touring tips and equipment. 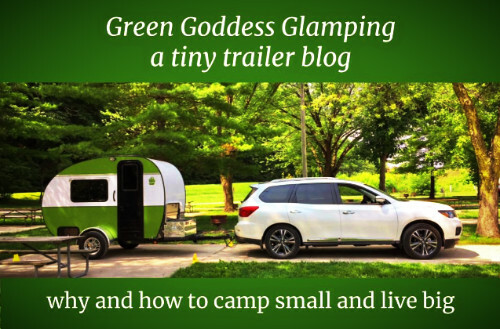 Camping and bicycle equipment, an "experts' corner," a forum, and cycling news are some of the areas covered on this site. 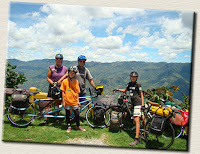 "We have dedicated our lives to bicycle touring, including a 5 year bicycle trip around the world! 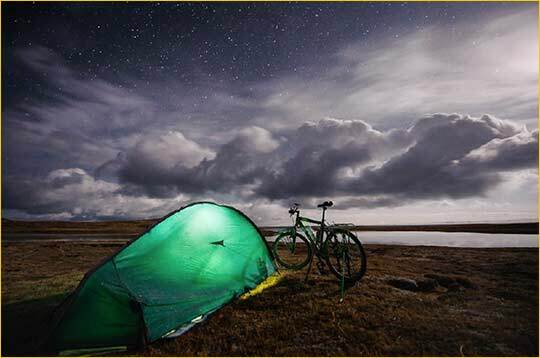 If you are looking for the toughest, most reliable and most adapted bike touring equipment, we are here to help you make the right choices for the best camping equipment and bicycle touring gear for your trip. We offer the most durable and reliable bicycle touring gear, advice, news and cycle touring tips to help you plan your trip." Down the Road: Jim Travis "saved [his] money, quit [his] job, sold [his] possessions and set off to travel around the world by bicycle" in 2002. He' "has no plans to stop," and his website chronicles his travels. The site includes articles on travel, useful information, and product descriptions, including his three books on his adventures. From his online letter regarding his 10th anniversary on the road: "When I look back through the trip pictures I can see myself age. I was a young 35 at the start. Now I'm a road weary 45. I've certainly grown older on this journey, body and mind. The aging process is documented in the thousands of pictures on my website, the journals, and my published books. Indeed, the website and books make up the bulk of the material possessions I've allowed myself to accumulate in a decade of bike travel." 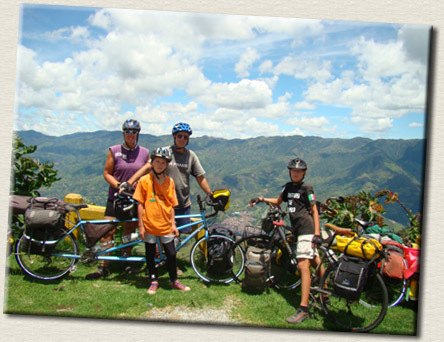 Family on Bikes: John Vogel, Nancy Sathre-Vogel, and their three children travel the world on bicycles. In 2006-07, the explored the USA and Mexico. 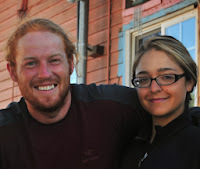 In 2008 they "cycled away from Prudhoe Bay, Alaska enroute to Ushuaia, Argentina. It was a journey of 17,300 miles through fifteen countries. [They] arrived at the southernmost point of South America on March 21, 2011." Their website contains educational resources on both touring and teaching kids. It also includes a blog, photos, and journals of their exploits. All in all, it's a great family-touring website. Free Life by Bike--Self-contained Exploration: Trenton and Rasham are riding their bikes around the world. They met at a meditation center in Northern California and decided after their time their to share their path. Trenton says that he wants "this path of bike touring, healing practices, mental development and spiritual inquiry" to be their life together. Rasham says that her journey is "fueled by love and a need to call a path my own." Their website includes a blog, visuals such as photos, maps, and videos, and reference sites. They started their journey in 2012 with a tour of the United States. They have their website set up for other continents, so following them should be interesting. They post infrequently and suggest an email subscription. Traveling Two--Bike Touring Inspiration: Friedel and Andrew Grant, two Canadians, ride the world on their bikes and write concise, to-the-point observations of their experiences. The site includes a free download of Bike Touring Basics, a book I found very readable and useful. Their site includes articles about touring the Netherlands, touring with their new baby, and much more. "So far, we’ve travelled through over 30 countries and cycled over 60,000km. Most of that distance was covered on a bike tour around the world from 2006-2009. We’ve also taken numerous shorter trips through places like Denmark, Spain and across our current home base – the Netherlands. 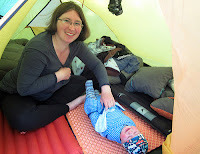 In 2012, we (unofficially) became “Travelling Three” with the birth of our son Luke. At the tender age of 5 months, he went on his first bike tour through the Netherlands, Belgium and France.